People always claim that there isn’t enough time in the day to cook or that eating healthy is too hard. Well I did all of this is about an hour or so – take that you “I can’t” people. Well to help you all go against your typical complaints below are two super fast recipes that can become your lunch and snacks for a week. 1. Turkey Breast (yes this is a bit pricey at Wholefood but try to catch it on sale). – I used this recipe for spices. Of course I changed this up completely and of course it came out fine. I had two smaller turkey breasts so these only needed to cook for about an hour or so. Also, I did not use lemon at all – I had it on hand but completely forgot about it. Instead of butter I used 3 large tablespoons of ghee and melted that up. Then I added in the spices & garlic. I used fresh parsley, dried thyme and tried sage. I am not even sure this if the recipe above is the one I used – because I apparently skipped on a few of the other ingredients. I did include salt and pepper. I mixed all the spices and the garlic into the butter to create a paste-like substance. I used a food brush thing and covered the turkey with it – making sure it really stuck. Once that was all gone, I filled the bottom of the pan with a little bit of chicken broth. NOTE: About 20 minutes into cooking I added a bit more broth. Once the top started to brown I took it out and used the fancy electric knife to cut it into pieces. I made one of these turkey breasts for myself and the other for the mom – we both have been enjoying them all week! Aside from the protein, I’ve also been making veggies in large batches so I can make sure to include them in every meal. For the asparagus I started by chopping off the ends and then laying them all out on a cookie sheet. While the oven was still hot from the turkey,I drizzled some olive oil on the asparagus and then covered with some salt and pepper. I baked for about 10 minutes – voila – asparagus for the week! 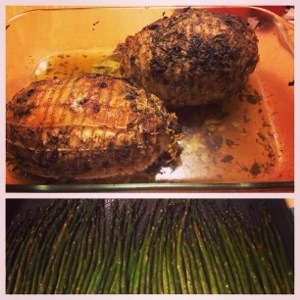 This entry was posted in Dinner, Lunch and tagged asparagus, crossfit, food prep, paleo, paleology, turkey, turkey breast. Bookmark the permalink.